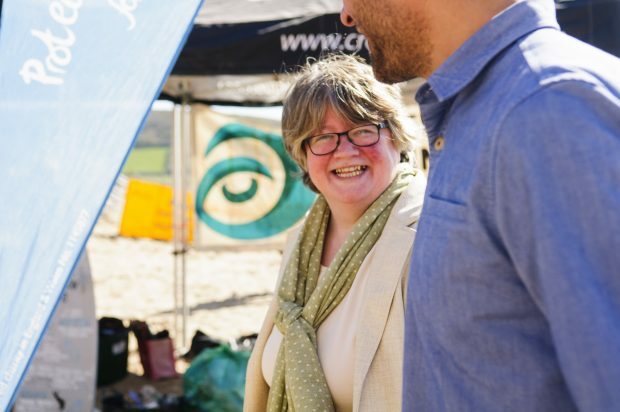 We were delighted to be joined by Environment Minister Thérèse Coffey, as she mucked in to help local SAS volunteers to clean up Devon’s beaches from plastic and litter as part of our Big Spring Beach Clean, which is taking place at over 420 beaches across the UK this week (3rd – 9th April). As the Parliamentary Under Secretary of State Dr Coffey sits at the very top table within the UK Government when it comes to making decisions on new, far more effective regulations that will prevent and reduce plastic pollution impacting our coastlines and we were delighted when she contacted us to say that she’d like to attend a Big Spring Beach Clean. Far from being a ‘photo opp’ Dr Coffey met with SAS CEO Hugo Tagholm prior to the beach clean to discuss what the Government can do to protect beaches, habitats and communities from the impacts of plastic pollution. We shared common ground in supporting the 5p plastic bag charge, which has resulted in over six billion bags being taken out of circulation, reducing the number of bags found on beaches by nearly half and discussed the imminent launch of the Governments new Litter Strategy (SAS sit on the advisory committee) which will include a range of measures that the Government hope will reduce litter and drive behaviour change. 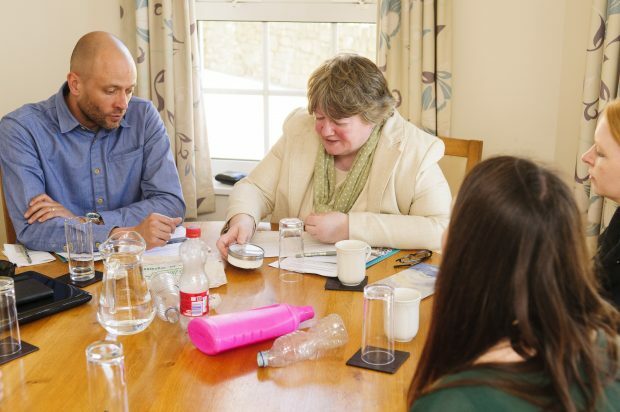 We were extremely encouraged by how engaged Dr Coffey is with the ocean plastic pollution issue and that, as a coastal MP for Suffolk, she shares our commitment to tackle it. 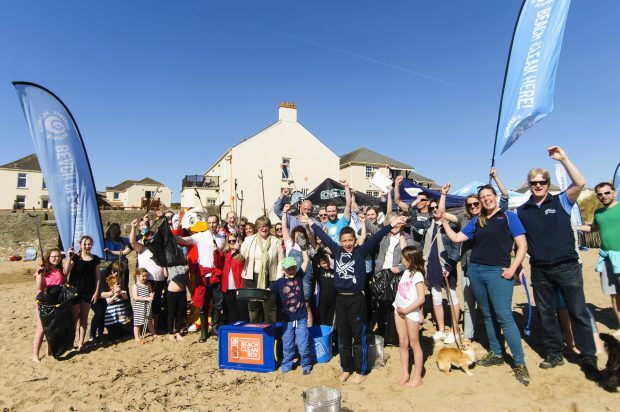 We were so proud of the 65 local volunteers who made sure Dr Coffey was in no doubt as to just how important our beaches are, perfectly demonstrating the incredible ‘Big Spring Beach Clean spirit’! From big wave surfers to tiny sandcastle makers our beach cleaners showed in our inimitable ‘optimistic conservation’ style that whilst we are committed to tackling plastic pollution on for as long as it takes we all long for a day when beach cleans are just a fond memory and we truly have Plastic Free Coastlines! We’re hopeful that this is just the beginning of our interactions with Dr Coffey on the plastic pollution issue, so watch this space for updates. I’m really pleased to see communities from across Devon coming together for such a great cause. Our beaches are enjoyed by millions of people around the country and we all have a role to play in keeping them clean and litter-free. “Not only is this event helping to improve our beaches and protect our wildlife, it’s encouraging people to reuse and recycle plastic wherever they can. The introduction of the 5p plastic bag charge was a great step forward and we remain committed to being the first generation to leave the natural environment in a better state than we found it. 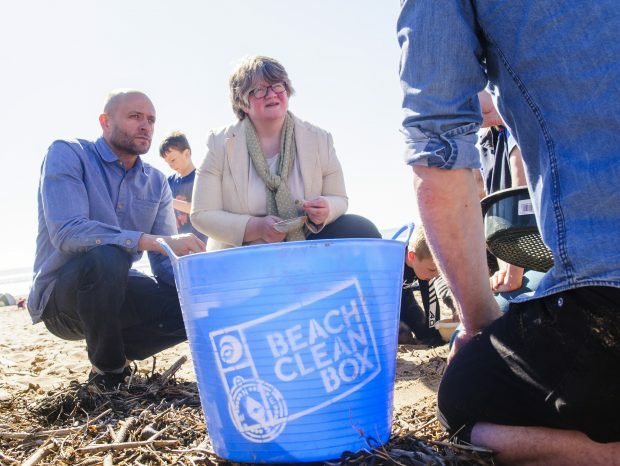 We’re delighted to welcome the Environment Minister to the Big Spring Beach Clean to help in our effort to tackle marine plastic pollution and inspire more action to reduce society’s collective plastic footprint on the environment. “We look forward to seeing the Government’s upcoming Litter Strategy and hope it will build on successful measures like the plastic bag charge. We’ll be recycling over 50,000 plastic bottles through the Big Spring Beach Clean and it would be fantastic to see new measures to help reduce the number we see around our coastline. « The Big Spring Beach Clean 2017 – Head to your beaches!